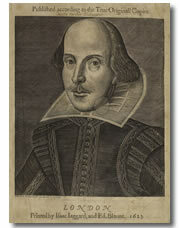 William Shakespeare lived from 1564 to 1616. He did not survive to see this enduring portrait. It appears on the title page of his first published collection of plays. This book is known as the First Folio. It was a collection of works put together by friends and colleagues as their own memorial to Shakespeare.